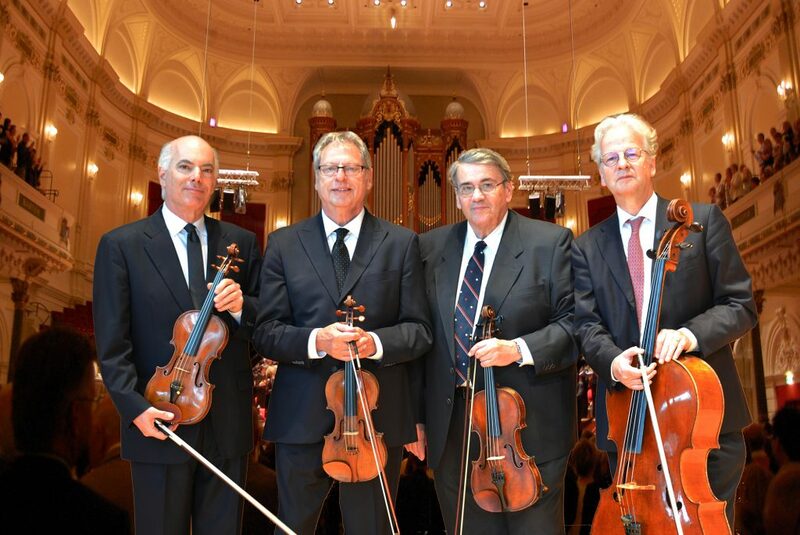 The Fine Arts Quartet, from left: Ralph Evans, Efim Boico, Gil Sharon and Niklas Schmidt. Roberta Rust, who is professor of piano and head of the piano department at Lynn University’s Conservatory of Music, joined the Fine Arts Quartet on Feb. 2 for a concert at the college’s Amarnick-Goldstein Concert Hall. Rust and the quartet teamed up for the Piano Quintet (in E-flat, Op. 44) by Robert Schumann. It was composed in 1842, the composer’s “chamber music year,” in which he also produced the three Op. 41 string quartets, the Piano Quartet and the Piano Trio (Fantasiestücke). The quintet is the most popular of them all, due in part to a felicitous combination of timbres and moods. The major mode opens and closes the work and imparts a confident and optimistic character to the often-virtuosic writing for both piano and strings. The players offered a performance on a high level. Rust, however, tended to undervalue Schumann’s marking of Allegro brillante over the opening measures and also made too much of the series of poco ritardandos in her part. In the second movement (In modo d’una Marcia), the espressivo passage in C (which shows what a strong influence this work had on the Piano Quintet of Brahms written more than two decades later) was somewhat unsteady rhythmically the first time but went better when repeated. After the Molto vivace Scherzo with its two trios, Rust sounded the opening theme of the finale, Allegro ma non troppo. As in the first movement, the tempo seemed too deliberate, underserving the music’s brilliance and gaiety. However, the spirit was exactly right from the double fugue leading to the movement’s close. The Fine Arts Quartet provided excellent support. On the first half, they were heard in the second (in G) of Beethoven’s Opus 18 Quartets and followed it with a novelty written by the first violin, Ralph Evans (b. 1953). His String Quartet No. 1 was completed in 1995, when he was 42. The other two movements were written at the ages of 13 and 14, respectively. Both had won National Federation of Music Societies awards. The work was released by Naxos on a CD with three other American string quartets. Since its debut in 1946, the Fine Arts has been centered either in Chicago or Milwaukee. Evans has led it since 1982, when he succeeded Leonard Sorkin. Second Violin Efim Boico joined that same year. Violist Gil Sharon (seated outside) and cellist Niklas Schmidt round out the personnel. They play very comfortably together and command impressive collective experience. The Beethoven quartet gave proof. Composed between 1798 and 1800, it is the most indebted of the six Op. 18 quartets to the musical gestures of the 18th century. In the opening Allegro, the first violin is decidedly primus inter pares. Its melodies are lightly accompanied. The courtly character of the Adagio cantabile is surprisingly disrupted by a furious but brief Allegro with the character of a sudden thunderstorm that is over in less than a minute before the courtly Adagio resumes. The succeeding Scherzo and finale maintain the good-natured mood. The performance was posed and tonally attractive. Unfortunately, the pianissimos were somewhat swallowed by the roar of the room’s air conditioner. They also were sympathetic advocates of Evans’s quartet. The composer chose to withhold which of the three movements were written when. They were a Moderato, Andante espressivo and Allegro scherzando, the last of which made the most favorable impression on this listener.